When most of us think of standing up straight, we probably arch our back a bit to straighten our spine. We might even shift the weight on our feet. But did you realize that your bite can affect your posture and how your posture affects your health? Posture and your bite are closely related. One affects the other involving muscles in the neck, back, pelvis and legs. Our bodies have a high center of gravity on a very small base. This is further complicated by the fact that we carry a veritable bowling ball – our head – on top of our shoulders. When we speak of good posture, we mean that the head and spine are balanced in relation to gravity. Bones provide the framework for the body. Joints are formed where two bones come together. Muscles attach to our bones and supply power for the movement. Nearly every muscle of the body works in a coordinated effort to keep us upright and moving. Poor posture can place unnecessary wear and tear on the joints. It can also cause the muscles to suffer, so do you. We might liken our posture to a delicately balanced mobile. Repositioning any part of the mobile will affect all the other parts. Maintaining the balance of the whole structure means that all the parts have to shift. When any part of the body is out of alignment with the other parts, there is a similar chain reaction. 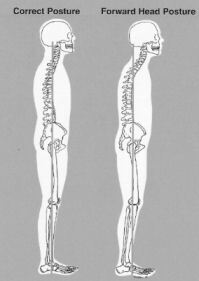 We can picture the body as a postural chain, with the feet at one end. What do you suppose is at the other end? The head? You’re close but more specifically, it’s the teeth. When your upper and lower teeth are closed together, each tooth actually forms a skeletal relationship with its opposing tooth. This bite determines the position of your jaw, and in turn, the position of your head on your spine. To demonstrate this, tilt your head backwards and close your teeth lightly together. Notice that your back teeth hit first. Now tilt your head forward - toward your chest- and again lightly touch your teeth together. Now the front teeth hit first. These exaggerated movements demonstrate how the bite and head position affect one another. It is just like the song, “The jaw bone is connected to the head bone, the head bones is connected to the neckbone… etc.” The teeth are part of the skeletal system. When your teeth are improperly aligned, there is often a compensating effect-or chain reaction-throughout the postural chain. The body will adjust itself. This can involve muscles in the neck, back and even those of the pelvis, legs and feet. Most Postural problems can be improved at any age, yet the longer the problem exists, the more difficult it is to correct. If the head is carried in front of this line, it places tremendous strain on the muscles of the shoulders, back, neck and head. The average human head weighs 15 pounds, and with each inch forward the strain of supporting the head triples! Further, the shoulders roll forward and the jaw is pulled back. This changes the bite. The bite can also influence the position of the head. If your knee joint was displaced, you would probably compensate by limping slightly. When your teeth are improperly aligned the muscles in your jaw compensate by torquing your jaw slightly to bring the teeth together. This causes the muscles to work harder. Over time, certain muscles may become strained. Muscles which are under constant strain become shortened. They may eventually pull the head to one side or the other. 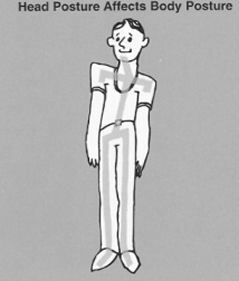 Yet, rather than walking around with a crooked head, we usually adjust our body to keep our eyes and ears level with the ground. This further aggravates the bite condition and may cause problems in other areas of the body – sometimes quite a distance from the teeth! We see, then, that your bite and your head posture are very much related – one – affects the other. Postural problems are often treated with some form of physical therapy. Treatment may include stretching muscles which have become shortened over a period of time, or teaching you to move your body in ways to minimize the stress placed on various muscles and joints. Correcting long-term postural habits, however, is not so simple as learning to “stand up straight.” Postural neglect can cause physical changes of the bones, joints and teeth. When your bite is involved with a postural problem the dentist must correct it so that the muscles, bones, teeth can function without strain and tension. Because the postural position of the head, neck and shoulders is so closely related to the bite, both dental therapy and physical therapy may be needed to correct the bite. Doing so will then frequently relieve seemingly unrelated symptoms such as pain in the head, neck and back. As the twig is bent, so grows the tree. So too, our body will adapt to its use over time. Poor postural habits become more difficult to correct the longer they exist, and they also become more injurious to your body. If you have any symptoms described, discuss them with Dr. Barron, who will determine whether or not they can be relieved by dental or other treatment.